Houseless, not homeless! : 21 December, 2012, National Homeless Persons' Memorial Day - "The Houseless"
21 December, 2012, National Homeless Persons' Memorial Day - "The Houseless"
This "Houseless" human would rather not to ever have an event to remember those who died due to others own unwillingness to be righteous under our Creators' Laws. If humans were righteous under his Laws, then there would not be a day to memorialize those who have died due to not having a safe, habitable and clean place to reside. Now more about "National Homeless Persons’ Memorial Day"
The date December 21 has meanings both ancient and new. Communities in every era have paused in awareness of waning daylight and the promise of the sun’s return; in our era, some will pause to look for assurance that the world keeps turning. It is appropriate that National Homeless Persons’ Memorial Day is December 21. For people living on the street, the darkest day of the calendar is especially dark; for a person to die on the street is an ending that should be unthinkable. Homeless advocates, today, will pause to honor the neighbors and fellow citizens who passed away in 2012 without a home. On the Alliance blog today, we will pause from studying homeless populations, from reporting on aggregate signs of progress in ending homelessness. With communities across the country, we pause in remembrance of each person who died on the street without a home. Each person had a name, a story, hopes and dreams, and human needs that went unmet. Each person experienced isolation but nonetheless was born of a family somewhere, and likely still belonged in some way to a family – of origin or of affiliation. Each person is missed, each should remind us of social and political failures we are left behind to overcome. And then, when we turn back to our larger goals of ending homelessness entirely, we carry this remembrance. We renew the commitment to reducing vulnerability of homelessness, as well as vulnerability to homelessness. As a member of a community of advocates, we speak for proven solutions – Housing First above all, then access to supports, family intervention for youth, treatments, and paths to independence. 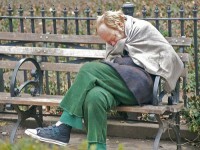 Living and dying on the street need not be part of the human experience. Image "Homeless and Cold" courtesy of Ed Yourdon's photostream. Thank you to everyone who commmorated 2011's Homeless Persons' Memorial Day! Thousands of you remembered your friends, family members, and neighbors who passed away while homeless in the past year. At least 157 cities in 40 states and the District of Columbia took part. See this list of local cities taking part, or let us know if your event is not listed. Each year since 1990, on or near the first day of winter and the longest night of the year, National Coalition for the Homeless (NCH), National Consumer Advisory Board (NCAB), and the National Health Care for the Homeless Council (NHCHC) has co-sponsored National Homeless Persons' Memorial Day to bring attention to the tragedy of homelessness and to remember our homeless friends who have paid the ultimate price for our nation's failure to end homelessness. In an effort to maximize the impact of the day, NCH, NCAB, and NHCHC have encouraged local and statewide organizations to hold memorials of their own. Last year, more than 152 cities across the nation sponsored events to honor those who had died and to recommit to the task of ending homelessness. This year, once again, we are encouraging groups to plan a special event on or around December 21, 2012. Some groups may decide to hold their event a day or so before the date. Want to know how to host a Memorial Day event? Work on getting a proclamation from your local and/or state governmental body. You will find sample proclamations in our Organizing Manual. Let us know in advance the logistics for your local event. This allows us to alert the national media of events happening locally. Once the event is over, let us know how it went, list of names read, how many attended and any media coverage. As sponsors with twenty years of experience, please let us know if we can provide any additional information, help or advice. Homelessness can happen to anyone. Take a moment to remember those who have died while homeless and learn more about this public health concern for those who don't have a place called home. Since 1990, on or near the first day of winter, and the longest night of the year (12/21/12), the National Coalition for the Homeless (NCH), National Consumer Advisory Board (NCAB), and the National Health Care for the Homeless Council (NHCHC) have co-sponsored the National Homeless Persons' Memorial Day to remember those who have died while homeless. 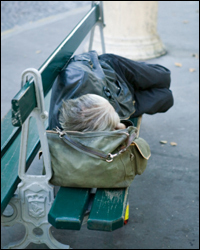 The lack of stable housing and access to supportive services are at the core of homelessness. The challenges that precipitate and often worsen during the course of homelessness can affect anyone. Addressing the public health needs of the homeless population requires collaborative and integrated efforts with partners and communities. Federal agencies are working to identify ways we can improve [PDF - 3.2MB] the lives of people affected by homelessness. CDC contributes by working to improve the spectrum of factors and environments that determine available choices for healthy living for everyone. There is much that we can do to improve the health of homeless individuals and families. On December 21, 2012, take a moment to reflect and join others as they remember those who have lost their lives while they were homeless. We hope you will take time to learn more about this public health concern. Please check out the links below for more information. 1O'Connell, J. (2005). Premature mortality in homeless populations: A review of the literature. Nashville: National Health Care for the Homeless Council, Inc.
“On December 21 – the first day of winter and the longest night of the year – Baltimore City will join communities across the country to bring attention to the struggle of people experiencing homelessness, to mourn the passing of our neighbors who, in life lacked stable housing, and to rededicate ourselves to ending the conditions that create homelessness,” said Baltimore City Council President Jack Young. The public memorial service will be held, beginning at 5pm with music, luminary lighting, and a period of quiet reflection, on December 21 at Baltimore’s Inner Harbor’s Amphitheater (the corner of Pratt and Light Streets) to remember those who died homeless in 2012. The program will begin at 5:30pm. The service is organized by members of SHARP, a coalition of homeless service providers and advocates working to Stop Homelessness And Reduce Poverty. The City Council’s resolution is available at http://legistar.baltimorecitycouncil.com/detailreport/Reports/Temp/1272012105344.pdf. For additional information on Baltimore City’s commemoration of Homeless Persons’ Memorial Day or to report the names of individuals who have died homeless, please contact us at memorialday@hchmd.org. 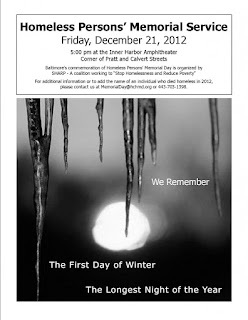 Event Details: Those who died homeless are remembered on the first day of winter each year in over 100 cities nationwide. The event has been attended by HUD (U.S. Dept. of Housing and Urban Development) Secretary Shaun Donovan as well as other federal and city officials (all of whom are invited this year as well). The vigil will be followed by a meal.